The Photostore is a beautiful and incredibly elegant theme offered by Mint Themes club which is especially designed for Photographers. This WordPress theme has all intricate features which will help you in carefully designing and developing a creative photography website. The theme includes all what your website requires, right from the full width slider homepage to the social media links and much more. The photos can be organised into “Collections”. This can be easily browsed by your website users. This WordPress theme also allows for selling photos or some other kind of digital format which can be accessed directly from your website. The theme comes with supporting guide and documents where step by step working of every feature is given. Using the documentation provided with this theme, the users can easily work will all the tools. The theme offers two page templates where one if for photo and the other is for video. You can add new page templates like links, etc. which have new functionalities and allow you to add more functions to your website or blog. 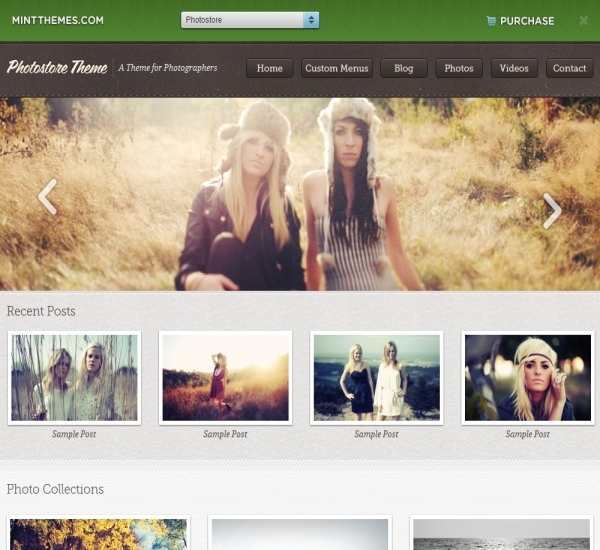 The users can also customize these page templates in the way they want. Widgets, being the most important part of WordPress templates, help the users to manage content easily and efficiently which is displayed on the sidebar of the page. Apart from this, the widget feature will also help you to manage footer and header portion of your website’s page. The drop-down menu option will make the visitor’s work of typing the article to be selected by containing different options in the drop down list menu. The homepage slider can be easily managed by the Theme options panel offered by this WordPress theme. The height of the homepage slider can be adjusted according to your website’s requirements. Moreover, the powerful theme options panel allows you to configure the right timings, and effects of the slider as well. The homepage slider offered by this WordPress theme is definitely going to attract a large number of viewers to your website. The theme offers a large homepage slider. The theme options panel can be easily customized so as to suit your website’s needs and requirements. The responsive layout feature allows the theme to be displayed on the mobile phone and other communication devices as well. The theme will adjust its display attributes like size, resolution, etc. according to the device’s screen thereby retaining all its features and functions. The gravity form styling feature will assist you in building and publishing your website quickly. You need to select fields, configure options, and simply embed those forms on the website using the built-tools. The other features supporting gravity form styling include visual form editor, multi-page forms, order forms, and conditional fields. This feature displays cool and simple social links whenever the user wants to on their website. Moreover they can add search box near them and engage their website visitors to emphasize on their social account likes Twitter, Google+, Bing, Facebook, You Tube, Flickr, Dribble, LinkedIn, and so on. Now organising your menu structure is very simple and this feature will provide a smooth visitor navigation system. The users will be able to choose what they want to include in their navigation menu and what they want to exclude. This feature rich WordPress theme offers an E-commerce setup option which will allow you to sell digital format and photos directly from the social media links, website, Flickr and Twitter widgets, etc. With the social links feature provided with the theme, you get the option to connect to Twitter account, LinkedIn profile, Facebook page, and many more. This is achieved using the customized Meta boxes inside the post editor. The full width slider is easy to manage with the help of admin panel. This theme is fully compatible with WordPress 3.4 version and works perfectly with it. All the features are very easy to work with. The final website created using this theme is great and supports all major features which a news specific website should have. The customer support and documentation is very helpful for using the features in the best possible way. The loading speed is slow when the website contains many images and data. The price of the theme is high as compared to the number of features it offers. The theme cost is $79.